Cyclamate is the second oldest artificial sweetener in use today. Dulcin discovered in 1884 is no longer sold anywhere. It was discovered in 1937 about 50 years after saccharin. It is the least potent of this group being only 40 times as sweet as sugar. It has a reasonable flavor but does have an aftertaste. For this reason it is often mixed with other sweeteners and seems to work very well if mixed with saccharin, the mixture tastes far better than either sweetener on it's own. Can be used like any zero calorie sweetener. It is heat stable and has a long shelf life so it is suitable for cooking and for the food industry. Works well as a masking agent and makes other artificial sweeteners taste better. Zero glycemic index. Zero calories. Not harmful to teeth. Suitable for diabetics. It is one of the cheapest sweeteners. It got a very bad name in the 1960s when tests showed the development of tumors in rodents if fed large quantities over a prolonged period. It was banned in the US in 1969 and has remained so ever since. However it is approved in almost every other country and is a popular sweetener today. More recently a report was issued on monkeys that had been fed large doses over 24 years. The conclusion was that there is no clear evidence of a link causing toxic or carcinogenic effects. See here. Artificial sweeteners do not always appear to be effective as part of a weight loss program. This is surprising as they contain no calories. However new light may have been shed on this mystery. A clinical study, conducted at the Weizmann Institute of Science in Rehovot, Israel and published Sept 17th 2014, has shown a relationship between the consumption of artificial sweeteners and metabolic problems. Saccharin, Aspartame and Sucralose were shown to effect the bacteria in the bowel in adverse ways. Tests showed impaired glucose metabolism in subjects, human and animal following moderate consumption over several weeks. More information is available at Science News. Further testing is needed, and indeed Cyclamate was not included in the trial. Also natural zero calorie sweeteners, such as Stevia were not tested. Nevertheless the results are indeed worrying. Perhaps these sweeteners have no role at all to play in weight loss and may be a poorer choice than regular sugar! Watch this space! The FDA does not issue an ADI for this substance as it is not approved in the US. Considerations are currently underway to review this, so it may be reapproved in the near future and an ADI issued. It is a totally artificial chemical. Often mixed with saccharin and sold as a generic sweetener. Sucaryl is a commom brand. Being one of the oldest artificial sweeteners one might expect it to be cheap - and it is! 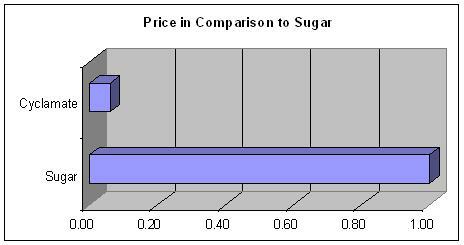 On the bulk market it is about 6% the price of sugar for the same unit of sweetness. The patent has long ago expired so it is a commodity product now most of it being produced in China. In 2012 it sold approx 1.6 million tonnes equivalent out of a total world market of approx 188 million tonnes. (Sugar was about 155 million tonnes) This would give it about 1% of the total market by unit of sweetness. By value it would be significantly less. It is the fourth largest selling intense sweetener, and is quite popular in the far east. 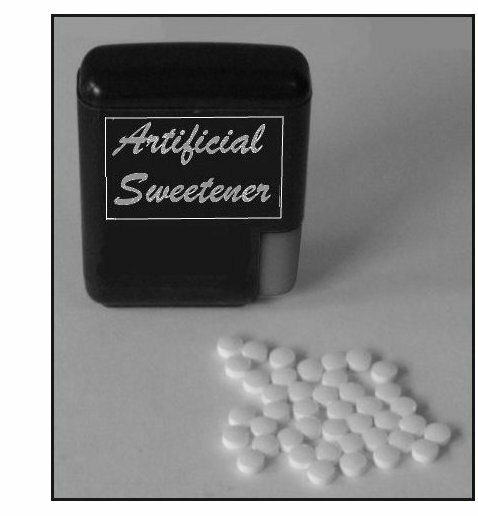 Like most artificial sweeteners it was discovered by accident. A graduate student named Michael Sveda was working on an anti fever medication when he noticed a sweet taste on the cigarette he had left down. It was approved by the FDA in 1958. Its approval was removed in 1969. Banned in the USA since 1969. Approved in 50 other countries. E952 in the EU. Tests seemed to show problems with rodents and primates if fed large quantities over a prolonged period. However Cyclamate is not absorbed by the body and is probably totally safe in small quantities. It has been used for about 70 years and despite the fears, no side effects have ever been reported in humans - that says a lot! Critics will cite the fact that it is artificial, name the chemicals used in its manufacture, refer to the tests on animals and declare it unsafe. But, unlike aspartame, they never point to side effects in humans because there are none! On the down side it is only 10% as sweet as most other artificial sweeteners and this means it is necessary to ingest 10 times the quantity. For this reason alone it would be sensible to choose an alternative.